A red pickup sits in a ditch along U.S. 82 East this afternoon as Eddy County Sheriff’s Office deputies and New Mexico State Police officers begin processing the scene. 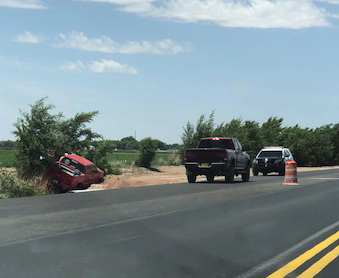 The Regional Emergency Dispatch Authority alerted authorities around noon to calls of a reckless driver along the highway, who was weaving and striking orange barrels in the New Mexico Department of Transportation construction zone. The driver eventually wrecked. No further details were available as of press time.